The PVM-4150 is a compact, OEM-style pulse generator module producing fast, high voltage wave forms to 1,500V. Optimized for driving high impedance capacitive loads, the PVM-4150 is well suited for driving extraction grids and deflection plates for electrostatic modulation of particle beams in time-of-flight mass spectrometers and accelerators. Its robust and versatile design also makes it well suited for pulsing or gating power tube grids, Pockels cells and Q Switches, acoustic transducers, microchannel plates, photomultiplier tubes and image intensifiers. The exceptional pulse fidelity of the PVM-4150 will optimize the performance of any system in which it is used. The pulser is a half-bridge (totem pole) design, offering equally fast pulse rise and fall times, low power dissipation, and virtually no over-shoot, under-shoot or ringing. The PVM-4150 has over-current detection and shut-down circuitry to protect the pulse generator from potential damage due to arcs and shorts in the load or interconnect cable. Unlike some competing solid state switches, the PVM-4150 incorporates all control and protection logic circuitry, energy storage and output network. It can be connected directly to the load, and does not require series or shunt resistors, impedance-matching networks between the pulser and the load, or additional energy storage (capacitor banks). All of this is taken care of within the PVM-4150. The pulser is housed in an aluminum enclosure, with threaded mounting holes in the base to simplify installation and assembly in OEM applications. 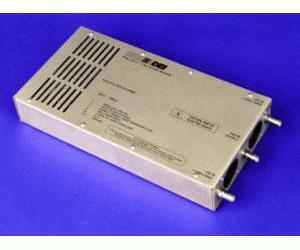 The PVM-4150 pulser is a direct-coupled, all solid-state design using air as the primary insulating medium. Its conservative design margin gives you long component life. And keeping the PVM-4150 free of potting compound or encapsulation materials makes it easy to service if a component ever does require replacement. Some competing products are potted, and must be replaced if they fail. But compactness and durability are not all you get in the PVM-4150. Inherent in the design is exceptional pulse fidelity with virtually no ringing, over-shoot or under-shoot, high average power handling capability, and protection against arcs, shorts and load transients in a reliable, economical module.